You know, if someone were so inclined (I'm not), he or she could ridicule you for having such a "ridiculous" notion. I have a big problem with ridicule in public discourse. I think it is more than counter-productive. All it does is make people dig in their heels and keep on keeping on fighting with each other. I quite agree that it is difficult to have 'alternate views' in this day and age, especially against scientific dogma. Back to this case in point.. The trouble is that is it easy to prove that the earth isnt flat. Yet still they persist in their flat earth cult. 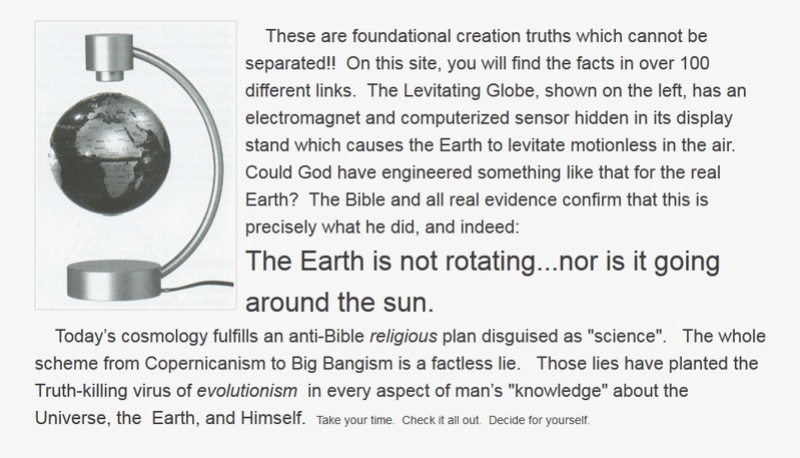 I have tried to show a few folk how the earth is round and they wont have it, it is fixed dogma. This is pretty ridiculous, its ok to have an alternate view, make a case and explain it. I looked into flat earth with an open mind, but it is easily dismissed. If the flat-earthers stopped here, admitted their lack of awareness and simple maths, then no problem... but they dont.. even against proof they are wrong.. so what word do you use? It isnt so simple to prove the earth spins, i do know of the Foucault pendulum experiments but I have doubt. It is reasonable doubt, and I have stated that I dont believe the earth is stationary, but spins... is this the same as the flat-earth claims? I wouldnt have thought so. I have no more energy for flat-earth, I have dismissed the notion in my mind now. I did a job for an RAF pilot (flies C130's) and asked him if he had heard of the flat Earth theory. Swanny wrote: I did a job for an RAF pilot (flies C130's) and asked him if he had heard of the flat Earth theory. Please keep us posted on that. I did a search to find where it was that Andy Basiago talked about flat earth and came up with only one source, which was an interview of him by Lisa M. Harrison which was posted on YouTube in May of 2015. It is a long video that is hard to listen to because there was delay in the audio and they talked over each other, but it was worth the frustration of that for me because I was not very familiar with his story or him and I took notes for future research. Instinctively I do feel that there is something within the flat earth theories that will eventually modify science. I say theories, plural, because there is more than one concept out there. Seashore wrote: I did a search to find where it was that Andy Basiago talked about flat earth and came up with only one source, which was an interview of him by Lisa M. Harrison which was posted on YouTube in May of 2015. NOTE; THIS IS A REUPLOAD OF THE INTERVIEW WITH A CORRECTION TO A TYPO IN THE TEXT. Andrew Basiago and Bernard Mendez discuss their involvement in the Mars Jump Room program during the early 80's along with Brett Stillings. Considering that the sun travels from left to right north of the equator and from right to left south of the equator... i like to hear the flat earthers explanation for this. Don't bother as original flat earthers are obviously gov trolls with nothing better to do than getting gov pay to confuse and obfuscate truths. I can see why Andrew Basiago could have an open mind about flat earth, considering what he has experienced in life. Time travel and Mars cover-ups, Andrew has been identified as a "planetary-level whistle blower". http://freemantv.com/ The story of his experiences with Barack Obama and other US chrononauts in the US secret space program in the early 1980's. Seashore wrote: I can see why Andrew Basiago could have an open mind about flat earth, considering what he has experienced in life. I am seriously confused now. Why on earth would anyone still be looking at flat earth as a possibility except for the first time they encounter the notion? seriously folk?.. flat-earth? forget it. its silly. except its probably more sinister than silly. Vidya Moksha wrote: Why on earth would anyone still be looking at flat earth as a possibility except for the first time they encounter the notion? You haven't watched any of the Basiago videos, correct? correct, i dont have the capability to watch videos online at the moment. nothing anyone says can change the fact the earth is NOT flat. Nothing. By anyone. In the northern hemisphere the sun rises in the east and at noon is in the south (equator side) and sets in the west. In the southern hemisphere the sun rises in the east and at noon is in the north (equator side) and sets in the west. This proves that the earth is a globe. I have recently subscribed to Mel Fabregas' Veritas Radio, and I've been enjoying his manner of interviewing people and the quality of his interviews due to the obvious time spent in learning the interviewee's subject matter. Mel Fabregas is not intimidated by the ridicule of the mainstream regarding flat earth. I like his inquiring mind. I am sat at my computer shaking my head in sheer disbelief at this point. I am done in here. In my opinion, anyone who cannot watch a video should not even be posting on this thread. What is the point in posting about something you know nothing about? One cannot discuss the topic at hand, which is a challenge to the official story on the shape of what we all call "earth," without the ability to listen to the people who are making that challenge. Seashore wrote: In my opinion, anyone who cannot watch a video should not even be posting on this thread. is that humour, or am i really entering the twilight zone? Many of the interesting 'problems' that I guess are being discussed in the videos you posted are due to the inadequacies of Newtonian physics, which dont really describe the universe too well. I can see the problem now, if newton had only watched you-tube, we wouldnt be in this mess. An Da Vinci, Aristotle and the rest, phhh, who can trust anything before google told us all how to think? is that a rhetorical question? in which case, you tell me. I dunno either. ok.. the mists is a friendly place for the most part. So, in the interest of possibly helping a few folk, i will make one last post. Not because I need to be 'right', but because this whole issue is making a jackass out of folk, and perhaps I can help a little? who knows? Not that I need to qualify, despite your suggestion to the contrary, I have over 3GB of flat earth material on my hard drive, many videos, many books. I saw most of Dubay's early work and got involved here in the mists (see above somewhere..) and elsewhere. I was curious to see if flat earth was true. I know their models. I know they are wrong. I read the book '100 proofs the earth is flat' (and others) and it is comedy in part. Interesting curiosities in others. It is really, really easy to prove, unequivocally, without doubt, that the earth is a globe and not flat. I can think of 5 such proofs, though 1 would be enough. The FACT, indisputable fact, observed by myself (to confirm) is that the moon is upside down in the southern hemisphere, compared to the north. This is an indisputable fact. No flat earth model could have this happen, and yet it is a fact of life, of our planet. It proves a globe. Do you understand that that fact alone means that flat earth cant be true? If you accept that fact, than save your other questions about our poor models of the universe and nasa fakes for other threads. If you cannot see that indisputable fact, then Huston, we have a problem. I posted a video a few post back, the guy who made that video has (had?) a lot of videos explaining a lot of the flat earth questions, i recommend you watch all his videos, to put the maths and common errors in perspective. The video i posted above provides a SECOND UNEQUIVOCAL PROOF that the earth is a globe. There are more such proofs. You cannot deny them. No one can. QED the earth cannot be flat. end of story. It cannot be both flat and a globe at the same time. This is not opinion but fact,. I dont need to watch you tube videos to know this fact. I can know the earth is not flat and I can point to the proof of this. i can do no more. Vidya Moksha wrote: Not because I need to be 'right', but because this whole issue is making a jackass out of folk, and perhaps I can help a little? At the end of that one, Mel Fabregas asks a very good question. He references a 2015 Daily Mail news story about a China Airlines Bali to Los Angeles flight that made an emergency landing in Anchorage, Alaska due to a pre-mature birth of a baby during the flight. He points out that it makes no sense whatsoever that the plane would land in Anchorage, as it's not near that flight-path, but it is on a flat earth map. In his book Eric Dubay quotes Neville T. Jones of Scotland. After doing a search for that name I stumbled upon a website the Fair Education Foundation, Inc., which states "The non-moving Earth & Anti-Evolution site." The founder of the site is apparently Marshall Hall (1931-2013), author of The Earth Is Not Moving. Maybe all the planets are actually floating in space, held there in all directions by the force of the aether that permeates the universe, but are much larger than the official story, with habitation being on the upper portion, giving the effect of a flat earth for all intents and purposes. I remember standing on the beach when I was a boy and realising that looking out to sea at the horizon that I could see the curvature of the earth. I tried it the other week and it looked flat. Maybe I have jumped into another reality?? Swanny wrote: I remember standing on the beach when I was a boy and realising that looking out to sea at the horizon that I could see the curvature of the earth. Monday's long-awaited total solar eclipse crossing over the United States is being met with consternation from Flat Earth enthusiasts who aren't quite sure how such an event is possible. An enlightening survey of Flat Earth community members by the Philly Voice reveals that researchers of the controversial conspiracy theory can't seem to explain how the highly-anticipated event fits into their cosmological world view and some researchers were left to simply throw up their hands in confusion over the breathtaking event. Today's long-awaited total solar eclipse crossing over the United States is being met with consternation from Flat Earth enthusiasts who aren't quite sure how such an event is possible. An enlightening survey of Flat Earth community members by the Philly Voice reveals that researchers of the controversial conspiracy theory can't seem to explain how the highly-anticipated event fits into their cosmological world view. Among the most prevalent theories offered by Flat Earthers is that there are heretofore undiscovered 'invisible celestial bodies,' described in Vedic astrology, that somehow cause the eclipse to occur. But that is a contentious concept which is hotly debated by researchers and other, less esoteric yet still rather arcane, reasons for the eclipse have been bandied about online as well. With no consensus among the conspiracy theorists, the eclipse has caused many researchers to simply throw up their hands in confusion over the breathtaking event. One member of the Flat Earth community told the website, "I find this eclipse topic so complex and very speculative. I think it is best left alone for now." Another researcher conceded that "I'm honestly not sure what I think creates the eclipse or what it means." Showing just how difficult explaining the event in terms of the conspiracy theory is, yet another person who advocates for the concept mused that, "we have to have something rise that causes eclipses in the flat-earth model. We think it's not necessarily caused by the moon, though it could be." Compounding the confusion is that the nature of the moon, itself, appears to be up for debate in the Flat Earth community as one person shockingly remarked, "I really, really don't know what the moon is." Despite all of this uncertainty surrounding the eclipse, Flat Earth aficionados hope that it will somehow provide evidence which will strengthen their case and some research groups are actually launching balloons during the event to capture this potential data. Additionally, taking advantage of the excitement surrounding the eclipse, an Oregon Flat Earth research group has purchased a billboard in the state capital of Salem, where thousands of visitors will be flocking for a view of the event. As in the past, the billboard buyers hope that the signage imploring people to examine the beleaguered conspiracy theory will resonate with the 'eclipse tourists' who will be passing through the city during the event. So while they may not be able to all agree on how an eclipse happens, the Flat Earth community remains committed to their cause and aim to use the event to further spread the word about the odd concept. And, with the next total solar eclipse due to pass over the United States in just six years, perhaps researchers can spend the time until then coming up with a theory that works within their world view and thus avoid all the confusion plaguing the community today. Figuring out what the moon is might be a good place to start. In the first half of Monday's show, numerologist Glynis McCants explained why this year's cycle of '1' is unfolding in such a crazy manner, how the '8' month of August is shaping up, and what to expect for the rest of the year. Looking at the date of the solar eclipse 8/21-- it was a double "3" day, she noted, and "3" promotes communication and making a fuss, so this relates to how the event became such a big deal across America. 2017, a "1" world number year, points toward competition, and this has been amplified in the "8" month of August, which has had many hard lessons unfolding, without any attempts at compromise, she observed. In the first half, numerologist Glynis McCants explained why this year's cycle of '1' is unfolding in such a crazy manner, how the '8' month of August is shaping up, and what to expect for the rest of the year. Looking at the date of the solar eclipse 8/21-- it was a double "3" day, she noted, and "3" promotes communication and making a fuss, so this relates to how the event became such a big deal across America. 2017, a "1" world number year, points toward competition, and this has been amplified in the "8" month of August, which has had many hard lessons unfolding, without any attempts at compromise, she observed. President Trump's numerology gives insights into his actions and traits, which can sometimes be at odds with each other, McCants suggested. He was born on a "5" day, and the shadow side of that number is chaos, but he's a "4" lifepath, which is considered a builder, and in control; he has a "2" in his birth numbers, which indicates he wants to be loved, but he lashes out when people cross him, she cited. All numbers have positive associations, as well as a dark or shadow side that can affect people, she clarified. She also detailed how the vowels in a person's first name represent a number, and specific personality traits. A leading authority on the application of psychedelic medicines or entheogens, and a professor of Religious Studies, Martin W. Ball, discussed the various ways cultures have explored different dimensions and realities, and how people can take control of their perceptions to lead a more fulfilling life. Entheogens are substances that alter consciousness, or create a religious state, and have a long history of usage in indigenous cultures, particularly with shamans. In such ancient cultures, entertainment, storytelling, spiritual experience, and religion are in some ways all part of the same package, he noted. In fact, one Amazonian shaman described the psyche altering plant, ayahuasca, as the "TV of the jungle," producing grand visions with rich narratives. Ball has been working toward the idea of "entheogenic liberation" for people, to help them understand and see past their false sense of self, and imprisonment inside their egos. There is only one universal form of consciousness, he stated, and our egos with their specific sense of identity keep us from this realization. "The ego," he mused, "is kind of like an outfit of clothing that we become so accustomed to that we identity with the clothing that we're wearing, and then if we take it off, we become very uncomfortable," as we don't know who we are anymore. "When we identify too strongly with the character that we're playing," he continued, "rather than the universal consciousness that we are, that actually leads to all different kinds of suffering and confusion." Is it rectangular as well or just a circular disc ? So this would mean the polar caps are not North and South but Left and Right ? So this would mean that the Sun and Moon ( which appear to be round ) retract reflected light to compensate for Snell's Law of Refraction ? Does this mean Satellite's are not necessarily required to beam line of sight , they are just there for show ? And last but not least , " Fool on the Hill " by the Beatles should be banned for misleading lyrics " The Eyes in his head See the world SPINNING ROUND "
Each time I look at this thread I laugh. It reminds me of many years back when people believed the earth was flat and ships fell off the edge if they went to far out to sea. I did think Andrew Basiago's descripton interesting but I thought back then he was referring more to experiences in various dimensions and his time travel experiences.. more pertaining to when aliens seemed to control where they traveled to within other dimensions.. were they flat?